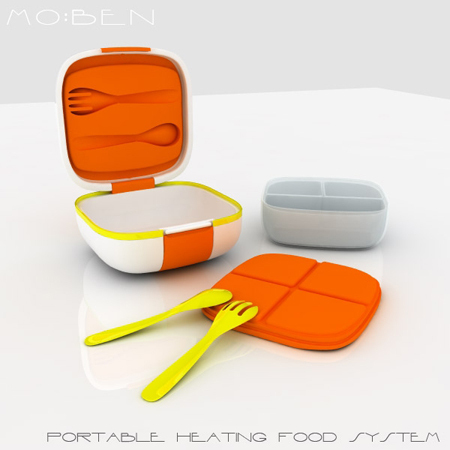 Mo:Ben is a handy food container that includes a built-in film heater component that can heat up foods to a pre-heated temperature. Mo:Ben’s main mechanism of maintaining the heat is the combination of foam-filled cavity insulation and the built-in heating factor. 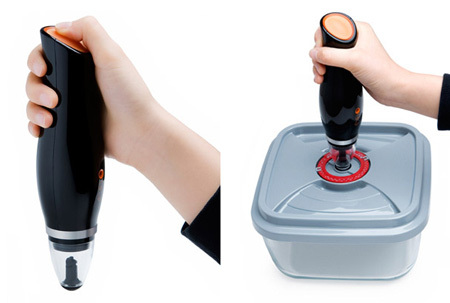 There are two main parts of the device; one is the external box that features a carry grip, slip protective rubber base and cutlery storage, and another is the temperature sensitive substance for food preparation indication. 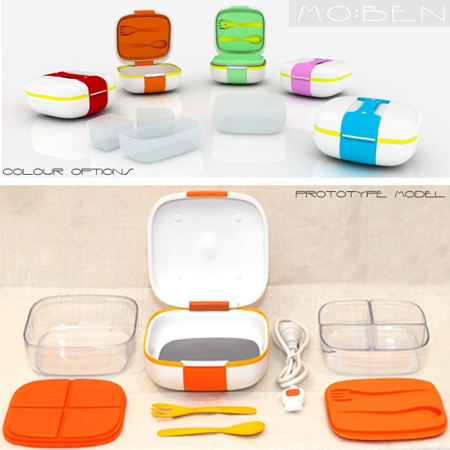 The internal box holds the food and can be detached for convenient dish-washing. 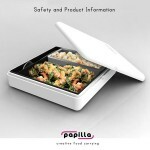 The arrangements inside the box are designed to encourage variety of food and mixing of food is prevented by different available compartments. This design has been inspired by traditional Japanese ideals of functionality and simplicity of the bento box while fusing it with modern technology of heating, insulation and materials. – Compartmentalization to 2 different portion sizes. – Variety and visual appeal. – Healthier options with the relationship to food consumption. – Negates takeaway waste as product can be reused. 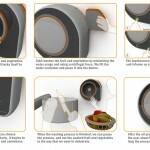 – Food contact parts easily removed for easy cleaning. 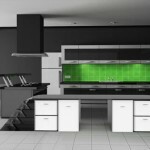 – Ease of use and cleaning encourages users to reuse the product. – The product and user interface is designed with a simple and clean sense of quality. 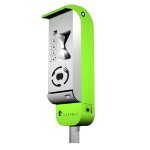 – Retractable handles are flushed with surface when not in use. – Overall package compacts into a single unit. – Silicone rubber is reminiscent of traditional rubber band around a box. – Silicone rubber acts as a non-slip base when eating with one hand. – Band colour choices allow for personality customization. – Designed for usability, the product has been considered through the process from preparation to transport, idle period, eating experience, and cleaning. 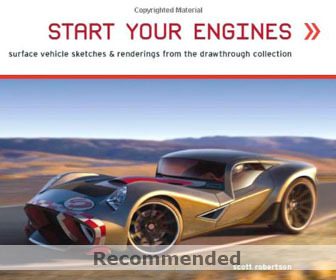 – Tested ergonomically through a series of models and prototypes. – Australian Standard for Plastic Materials for Food Contact Use, AS 2070-1999. – Food Safety Standards – Temperature control requirements. – Australian/New Zealand Standard for Safety of household and similar electrical appliances, AS/NZS 3350.2.15:2002. – ISO 20282: “Ease of Operation of Every Day Products”. 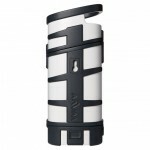 – Internal Box is made of Polycarbonate for its durability. – External Box is made of A.B.S for its availability and strength in appliance applications. – Foam is used for insulation, ease of manufacture, availability and cost. – Film heaters embedded at the base of the product, heating the internal box from bottom up. 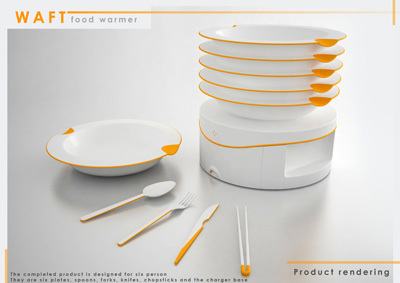 – Food is heated to 75 degrees Celsius, controlled by an internal thermostat. – Electronics are divided up into an active unit – electronic control adapter and a passive unit – lunch box unit to enhance safety. To conclude, the product seeks to address a culture through design and present a new and satisfying experience for the user. Tagged as cavity insulation, colour choices, film, Food, food consumption, insulation, lunch options, rubber, safety, silicone rubber. Actually, it seems to be the perfect lunch box i"m looking for. Can this box also hold the food cold for exemple a salad as there is no fridge at my workplace. Do you intend to put this on the market shortly and how much will this cost ? Or do you intend to sell it exclusively on internet ? Any way this is a brilliant idea. Hey there, I think it's a brillant idea. Are you looking for distributors? Where or how is it possible to buy this for witchprice ? 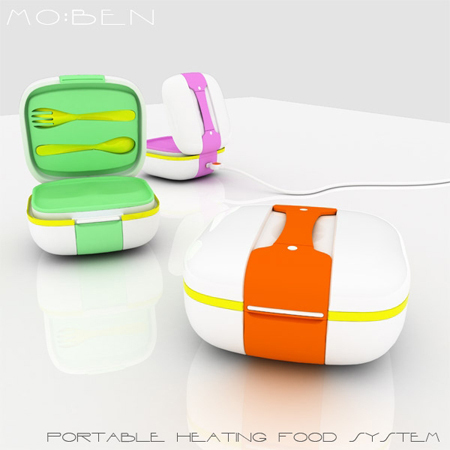 How can I buy this (portable heating food system)? A very useful contaıner. I want to have . Can you help me How I can fınd and buy thıs ? Please gıve me the address and the telphones. I Want it how can I get one or when is on the market? how can buy it I need it now please! pls. let me know where i could buy this. This is a great product! This would help a lot of parents with children of severe food allergies like myself! When & where can I get one (or two)? 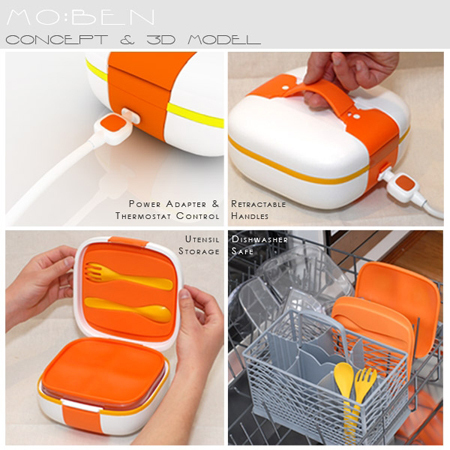 it's very good idea and useful lunch box. I want to know how much it costs ? and where I can buy it ?? Very good. I want to know how much it costs, and where I can buy it. where can I buy this item…how much…. where can i buy this lunch box? it is what i am looking for. Although this is a really old post, you should really try to get Venture Capitalist or Angel funding for this project. This is without a doubt one of the best ideas I have encountered. Given the current fincial situation, many office workers can not afford to purchase hot meals at canteens or outside of the office. Is this was affordably priced (~$50-$60) a box, then the payoff period for a consumer, would be such that the product would more than pay for itself. Even better would be a portable battery to accompany it, so that it does not have to be electrically tested by companies prior to use. Even better, why not dry something like Dragons Den (a UK TV show). where can I find this and what is the price for it???? would like very much to know where I could obtain this product. sounds exactly like what I've been searching for. what wattage does it pull? I am still waiting to get an information about this product. I will be happy to go into franchise with the designer. Please get back to me if possible. Now that’s really convenient. Who wouldn’t want a nice warm meal anywhere they went? I would like information on MO:BEM . I WOULD LIKE TO PURCHASE ASAP . please, where can I buy this? i am interested be your distributor in Russia. Hi, is MOBEN already on the market ? I m in the Uk. Is it available in Dhaka, Bangladesh market? What is the price for it? 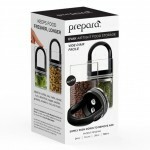 I want this portable food container. How buy it? Hi! Where I can buy it? When is it coming out or is it already out? Anyone! Please forward website of link. I hope it’s not just an awesome idea …. This is really a lunch game changer. I really need this….